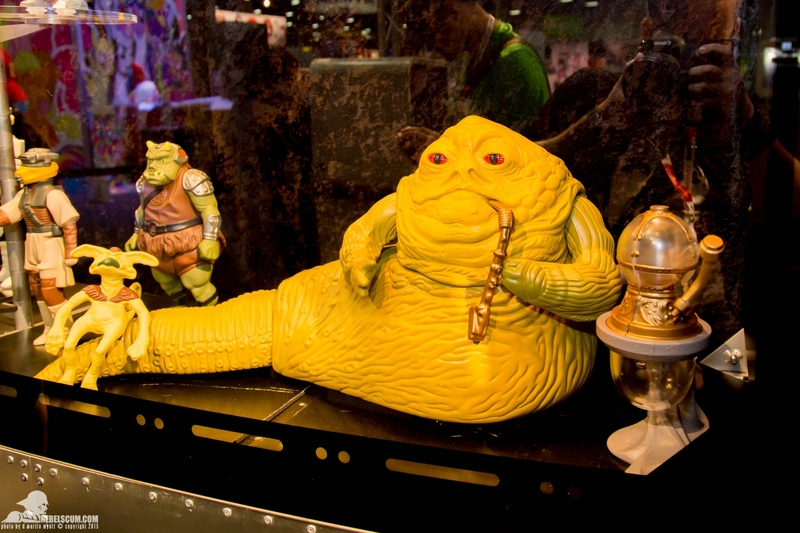 Rebelscum has posted photos from Gentle Giant’s booth at SDCC that give us our first real photos of the upcoming jumbo Kenner Jabba the Hutt figure. We first heard about this figure (a version of the original vintage figure blown up to 1/6 scale) nearly a year ago, but things had been pretty quiet since then. That, and the general dearth of news about the jumbo Star Wars line has led some to worry that it might have gotten shelved, but that does not appear to be the case. The first thing you’ll probably notice is that there’s no throne. When they announced this figure last year, they used an image of the original vintage figure on the throne, which seemed to indicate that they would be replicating the entire playset, but now I’m not so sure. It’s just a prototype, but one would think that they would at least mention it if the final product was going to include the throne. I held off posting about this since I wanted to try and get a definitive statement, but so far haven’t found anything. If you know, please leave a comment. Jabba himself looks pretty good, although he is similar to many of the other entries in Gentle Giant’s lines of jumbo Kenner figures in that he’s not an exact match for the original. One problem that the figures have had is that the plastic used is different, and the paint is often more of a matte color. In more extreme cases, they have been altered in scale, had additional “made up” details added, or been otherwise altered from the originals. Since this line is entirely based in nostalgia for the original Kenner figures, these decisions are vexing. 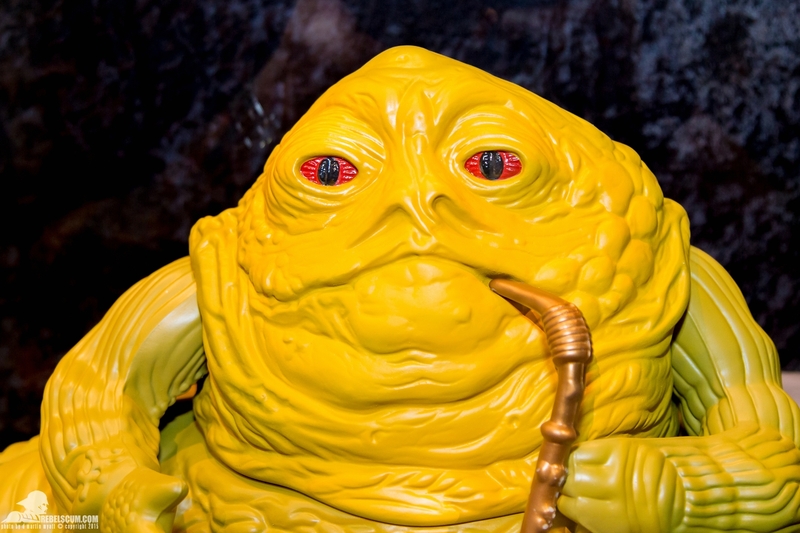 In this case, it appears that Jabba’s head and arms are made of the same plastic as his body, instead of being a more rubbery material as with the vintage figure. The color seems more yellowish as well, but that may just be because of the flash photography. If you click the photo of his head for a larger view, you can also see that they have just painted the eyes instead of using the clear plastic inserts that were used in the original figure. 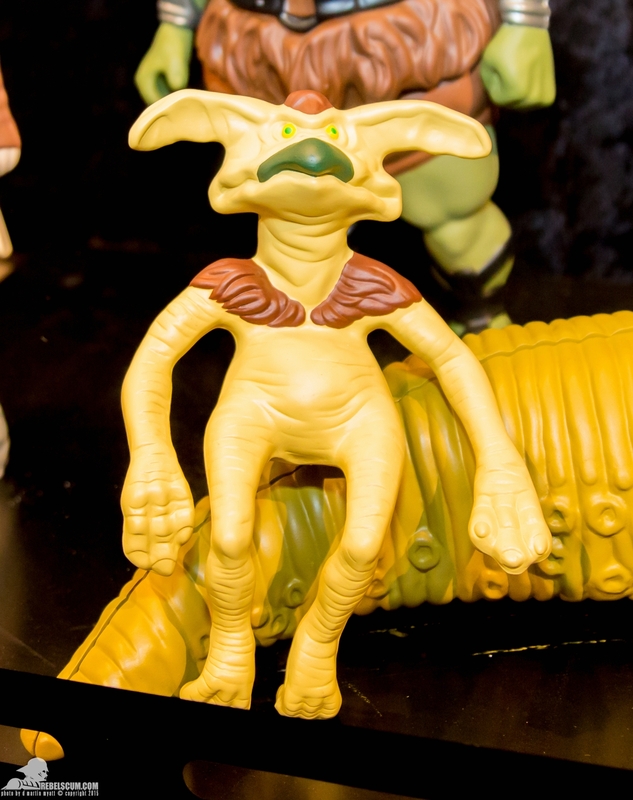 The good news is that he will apparently come with at least Salacious Crumb and his railing/hooka pipe. Unfortunately, the video below from Yodasnews seems to indicate that pricing will be from $600 to $800, assuming I’m hearing it correctly (there is a LOT of background noise). That’s a pretty hefty price tag if it doesn’t even come with the throne — it’s many time more expensive than Sideshow’s excellent 1/6 scale Jabba setup, although that was admittedly released a number of years ago. They are apparently aiming for a fall 2015 release, so I guess I’d better start saving my pennies. $600—$800? That’s ludicrous! If that’s the case, it’s hyperlane robbery of galactic (gangster) proportions. Fitting, I guess. Bargon wan chee kospah! I can’t disagree with you there, although I think it’s probably more or less consistent with the previous prices in the line ($400 for the Wampa for example, which I thought was highway robbery at the time). But if I’m paying that much, I want the whole playset, darn it! Agreed! The dais is a must have or it’s a no-go for me. I can’t justify spending that kind of money on it if it’s not going to display properly. For that money they should scan the unreleased Gargan figure and hide her in the dais’ trap pit. 😉 I hope GG is reading your site because they’ve got some serious issues to address.